Announcement We specialize in Custom Soap Favors for birthdays, Weddings, Bridal and Baby Showers, and Everyday Fun! We specialize in Custom Soap Favors for birthdays, Weddings, Bridal and Baby Showers, and Everyday Fun! We changed our shop name in 2017 from Sweetbody Soaps to Olive and Dewdrop. And don't forget to pamper yourself by picking up some of our Luxury Soap Bars...Your skin will thank you! In search of the perfect party favor! Having worked in the party and event planning business for over a decade I was always in search of the perfect themed party favor. One that looked great, was of high quality, yet affordable, and one that guests would actually use after the party! It was then, that I discovered the world of soap-making and found my true passion. A place where I could create a quality product with skin loving properties, and incorporate the personal touch of the customer in their unique custom soap favor. In 2010 Sweetbody Soaps, n/k/a Olive and Dewdrop was launched! 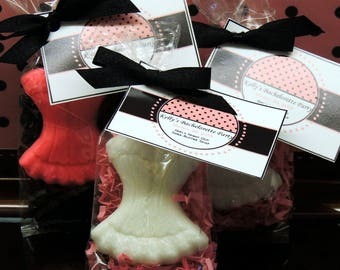 I love what I do and look forward to creating the perfect soap favor for your special event! Thanks for stopping by! Party Favors are our business so feel free to convo us to discuss your next special event!